After the traditional recap from last year, it was time for the opening number, a celebration of hela Sveriges fest. But was there really any need for "Melo-f***ing-difestivalen"? Maybe it was a nod to the potty-mouthed entries in the weeks to come? 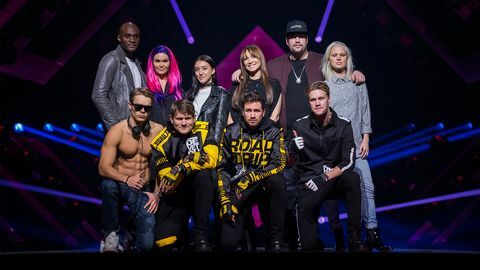 Even if it was a return to a very familiar venue in Gothenburg, there was a new look to Melfest with not one, not two, but three presenters. 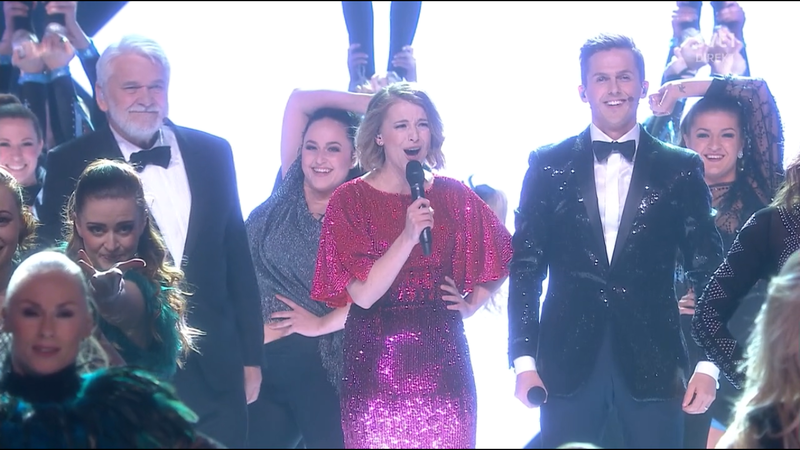 Gina Dirawi had co-presented for three out of the previous five years, but this year marked the presenting debut of blogger and presenter Clara Henry, joined by former contestants David Lindgren and Hasse Andersson, I thought they were a good mix. Clara was very professional and I would definitely welcome her back to present the show again. Over this year's contest, David effortlessly made the leap from three-time competitor with that dull boring-bank-clerk reputation, to an all-singing, all-dancing revelation with a great sense of humour. Who knew? Well, he is a very experienced musical theatre performer, and that experience certainly paid off in this year's Melfest. And as for Hasse....aww bless! Hasse is just, well, Hasse, and is there for no other particular reason other than tying us up in knots with his unique Skåne dialect. To begin with, it was incomprehensible, but as the weeks progressed it became all the more endearing, and his reading out of the "nio nio nio" telephone numbers was a weekly treat. This year's stage set was diamond-shaped and very futuristic. I liked it and thought it was an improvement on some of the more anonymous sets of recent years. The postcards this year focused on the artists at home with their families or showing them following particular interests. It was a nice personal touch. The same electro-dance music as last year was also used for the postcards and I was very happy with that. Week 1 featured no less than 4 returnees - Boris Rene, Ace Wilder, Dinah Nah and 1999 ESC winner Charlotte Perrelli. "Her Kiss" - Boris Rene. Boris provided a lively start to the show, with a song by the Larsson/Lundgren partnership who have been a regular fixture in Melfest over the past few years. "Her Kiss" wasn't as instant as the "litter box" song from 2016 but I quite liked it, even if most of the fandom didn't. 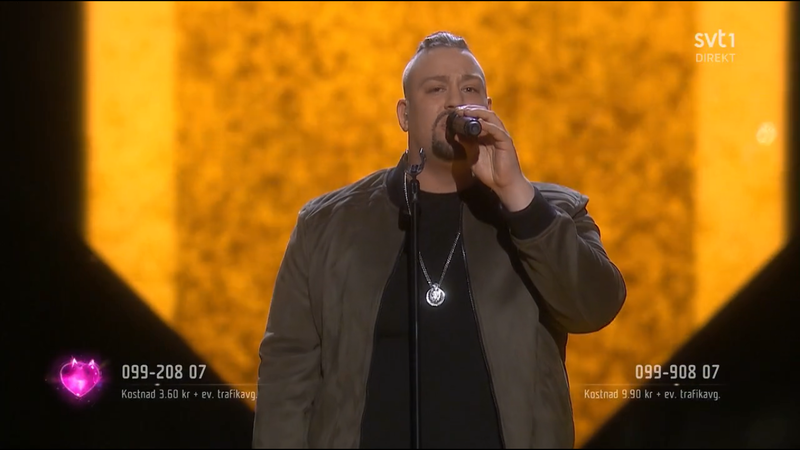 One more piece of good news: everyone's favourite dancer Edin Jusuframic was back again :) In case you don't know who I'm talking about - if you think back to "Love Love Peace Peace" in last year's ESC final, he was the young guy replaced by the old guy with the traditional musical instrument! Adrijana has a fascinating background and she had a very interesting postcard as well. Unfortunately this was in the 'slot of death' and she struggled with her vocals at times. I think I read somewhere that she wasn't feeling very well in the lead-up to the show. 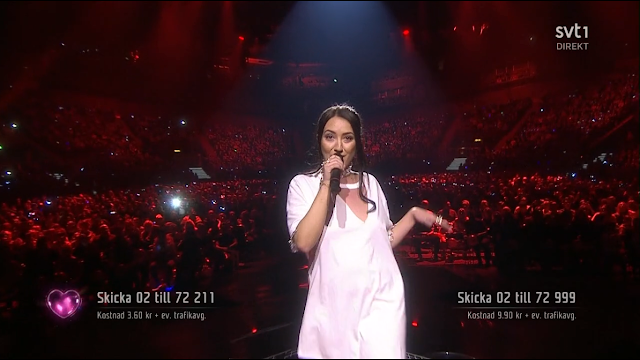 Despite some positive comments from Melfest fans she probably suffered from the draw position and lack of name recognition. "One More Night" - Dinah Nah. Dinah's styling was really over the top this year -a cross between After Dark, Charlotte Perrelli and showgirl-Kylie, and topping it all was a pink wig. Yes it's all old-school Melfest but this song just didn't have the same appeal for me as "Make Me (La La La)" although having said that, it took that song some time to grow on me. "Road Trip" - De Vet Du. 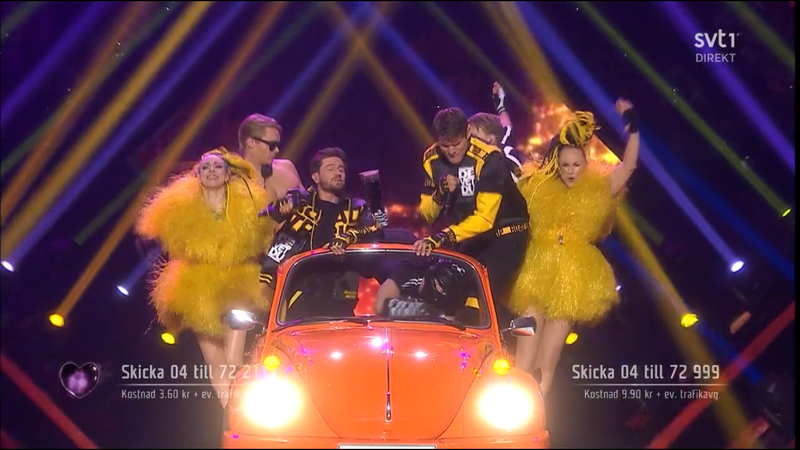 De Vet Du are that most modern thing - YouTube and social media stars crossing over into Melfest. One of these guys is called DJ Hunk. (The process of elimination should have been a pretty easy one). He must save a fortune on clothes - well, tops anyway! There were lots of sharp camera angles, and it was filmed like a music video. I expected to hate this but it was good fun, and I do have a slight crush on Christopher Martland....! 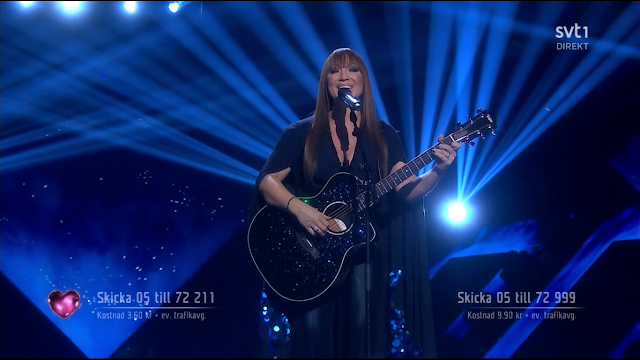 "Mitt Liv" - Charlotte Perrelli. A very cute postcard for Charlotte Perrelli, featuring her little boy. The only glitter going on this time round was the glitter on her cape and her guitar. Yes, that's right, an acoustic guitar - what???? This was really just a promo for the all-new Charlotte with a rather dull new musical style, and no-one was buying it. Good luck to her though for staying true to herself. "Wild Child" - Ace Wilder. 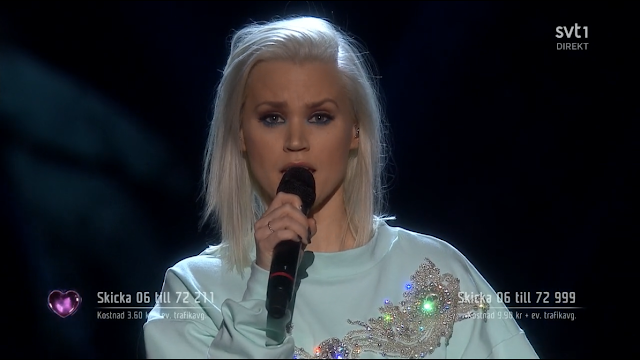 Ace was dressed in a crop top and tracksuit bottoms, although I wasn't keen on her new platinum blonde style. "Wild Child" (a G:son co-write, no less!) was perhaps a more 'accessible' pop song and showed a softer side than her previous entries, although I have liked all three of her Melfest entries to date. Rag n'Bone Hozier? This song seemed to be influenced by those recent hitmakers. New name Nano had a back story of course, which has had a lot of publicity. He's now a reformed character concentrating on his music career. 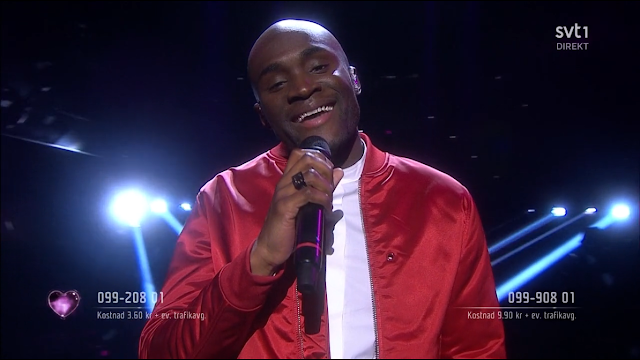 With a number of very positive reviews of this contemporary song before the first heat, it was no surprise he did so well. 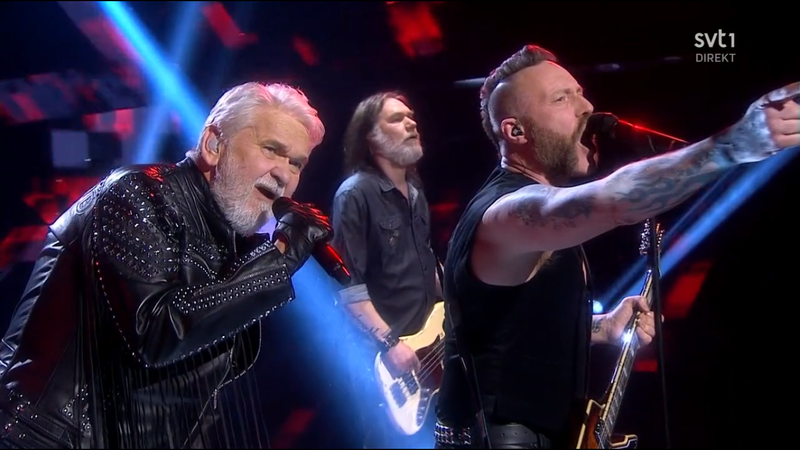 The interval act featured a musical makeover for Hasse Andersson, reinvented as the "bad boy of heavy metal", head to toe in leathers, performing on stage with Mustasch, whose frontman Ralf competed in Melfest 2013 with "Bed On Fire". Hasse's beloved song "Änglahund" was reinvented as "Hound From Hell"! The second interval act of the evening was the Gothenburg Opera Dance Company with "Untitled Black", a modern dance number. I don't really like 'contemporary dance' all that much if I'm honest.